The sign below was found outside a church in Balham, London. What Could You Never Say in Church? Funny, they said the same thing about me at my latest dom/sub dinner party. ‘Tis a good match, actually. There are plenty of scammers on ebay who tell you that you’ll receive some goods; but, in the end, they just end up taking your money, wasting your time and leaving you completely empty. 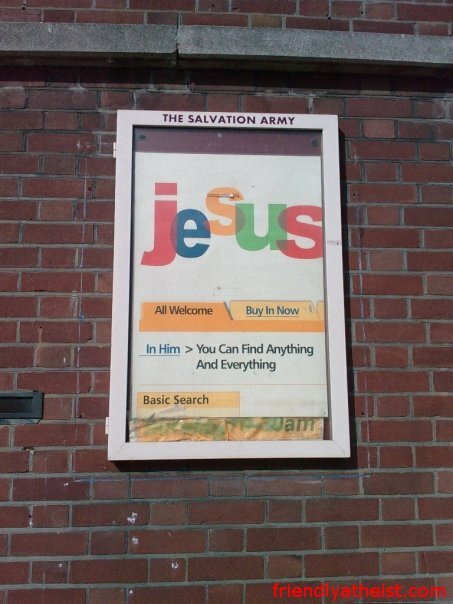 Selling Jesus is big business and highly profitable. How apropos that they should ask you to ‘buy in’. Isn’t that the same term they use for cons and scams? Is that a pending lawsuit I smell? The user interface doesn’t seem to be working. Is the site down? I’ll watch it for a while and then be the last minute bidder. I think Rule 34 needs to be applied here somehow.